Dave Browne has begun his world record attempt in Dublin this afternoon and says the hardest challenge will be to stay awake for the next four days as he strums his heart out. AN IRISH MUSICIAN has today begun attempting to break the Guinness World Record for the most time spent playing a guitar. 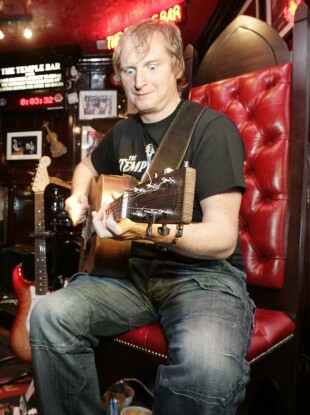 At 4pm this afternoon, Dave Browne picked up his guitar and pleck and began his world record attempt at playing the guitar for 101 consecutive hours at The Temple Bar pub in Dublin. The current world record is held by Guillermo Terraza from Argentina for 100 hours of guitar playing which he completed in May of last year. Browne, who has played with the likes of The Commitments, The Dubliners, Aslan and the Pogues, will be joined by friends and fellow musicians as he begins his world-record attempt. He says he’s been in training for the past nine weeks and that the hardest challenge will be staying awake. It’s been something that I have been planning to do for years now and I feel as though I am finally ready for it. Playing guitar comes really naturally to me but I have to say, staying awake is going to be the biggest challenge. The longest guitar session I have played to date is three days so this is going to require a serious amount of mental endurance to get through over 100 hours with hardly any sleep. But I’ve been training for the last nine weeks and feel very fit and ready for what’s ahead. The rules stipulate that reasonable songs must be played to a reasonable standard and that apart from pauses between songs lasting no more than 30 seconds, play must be continuous. Five minute breaks are allowed after an hour of playing but if Browne wants 30 minutes of sleep he has to play for six hours straight. Can Dave go all the way? You can follow his progress on Twitter and Facebook or watch the event live here. Email “Irishman attempts Guinness World Record of playing the guitar for 101 hours straight”. Feedback on “Irishman attempts Guinness World Record of playing the guitar for 101 hours straight”.